We can almost completely restore the New Testament off of the early church fathers alone. 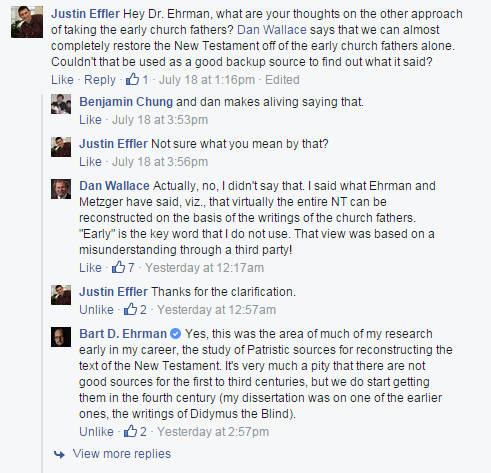 As Dr. Ehrman points out, this cannot be done using the early Patristic writings (1st to 3rd centuries). Unfortunately, this is quite a popular argument used by Christian apologists, and it’s long overdue that either Dr. Wallace or Dr. Ehrman corrected lay Christians on their use and abuse of alleged arguments by scholars. Reblogged this on Islamic Archives .